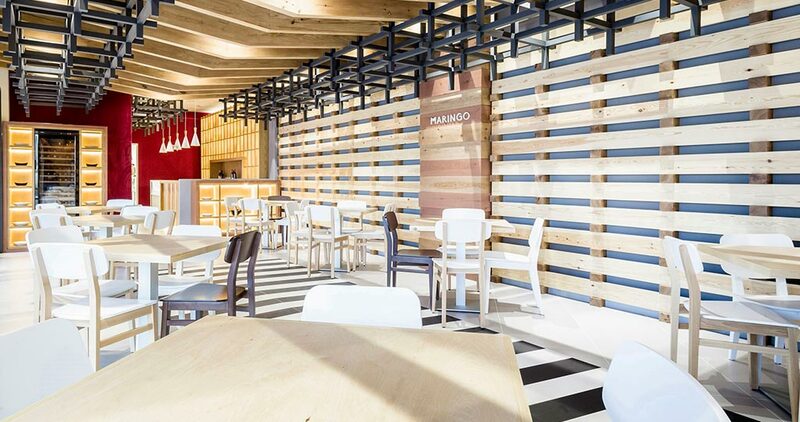 The overall feeling when entering Maringo, a restaurant in Conil de la Frontera, is that of deep dynamism, that of being in a warm and fluid space which manages to create infinite points of view. A spatial interior design contrasting completely with traditional gastronomy tasting, but always recreated with cutting-edge culinary techniques and innovative recipes. 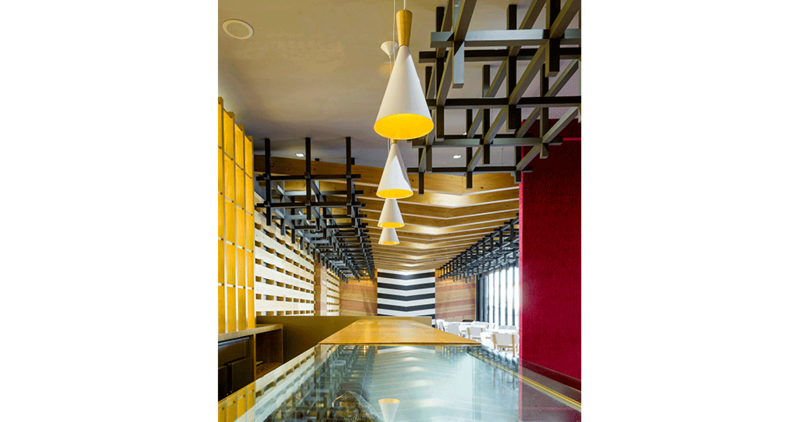 The industrial like restaurant project has been carried out by Jose Ramon Losada, from the Velvet Projects studio. This stands out not only for its unique layout, but also for the special integration of materials such as steel and wood or the discordant colour notes. 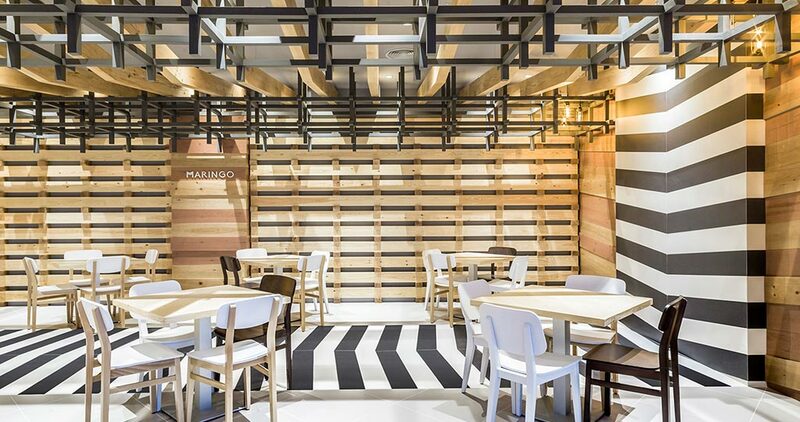 Regarding its interior design, first and foremost, Maringo moves away from formalities. To do this, raw materials are used in their most neutral and timeless form to create an artificial atmosphere, whose elements are static compositions simulating constant movement. The space, lined with natural wood, leads to the main view of the initial of its name, a giant ‘M’, around which the whole room is arranged. It is also important to put emphasis on the PORCELANOSA Grupo‘s contribution to this project. 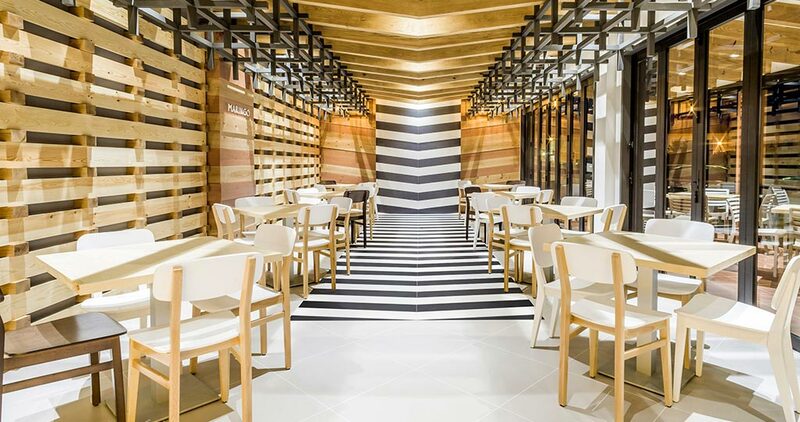 Done by Urbatek, the firm brings a big central tapestry in black and white to life, which provides the space with dynamism and modernity, and also makes the flooring eye-catching. The material used for its creation is the through-body porcelain tile by Urbatek, created from a special production of porcelain in 119x119cm. This composition is also implemented on some parts of the covering, which when being combined with natural bare wood, a very modern and lively aesthetical effect is achieved. 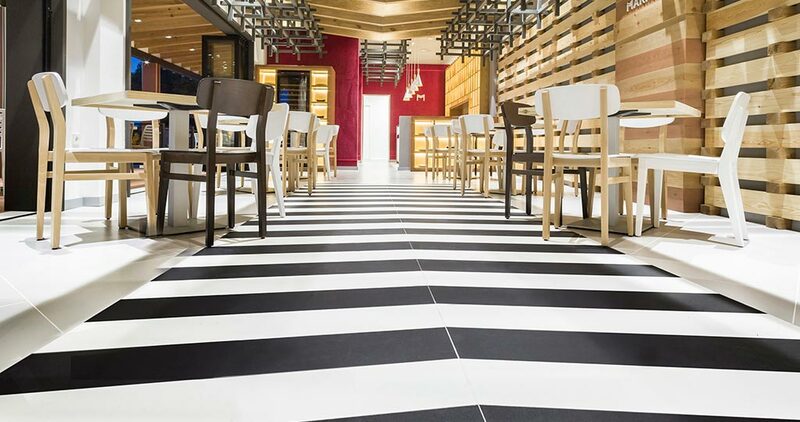 For the usual flooring, beyond the dowel, a full through-body porcelain version has been also used, in other words, the Town Niquel Nature series in a 59,6×59,6 cm format. Regarding the kitchen space, however, the choice has been the Deep Grey 59,6×59,6cm, a model of anti-slip porcelain in a stony finish. 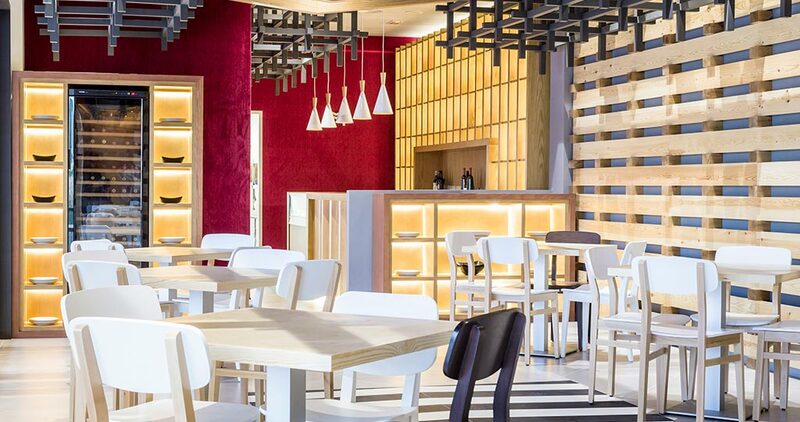 The through-body porcelain by Urbatek has turned out to be highly interesting and suitable for this restaurant project in Conil de la Frontera, not only because of its aesthetical power, but also because of its resistance and durability. 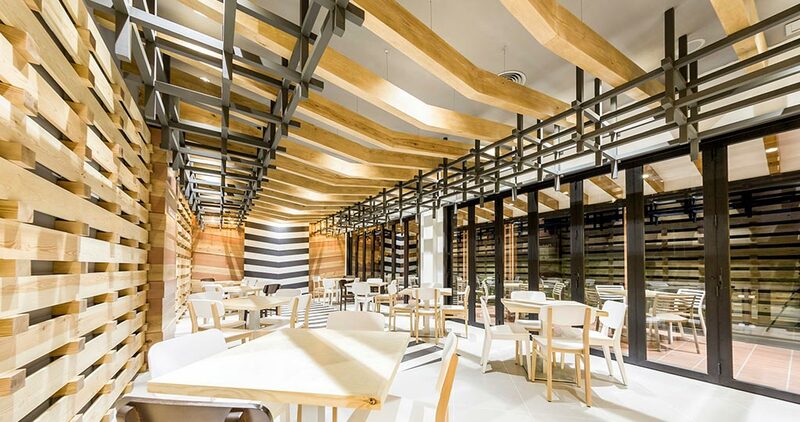 This material is ideal for high-traffic spaces as this restaurant project is, and also ensures top quality and easy cleaning. 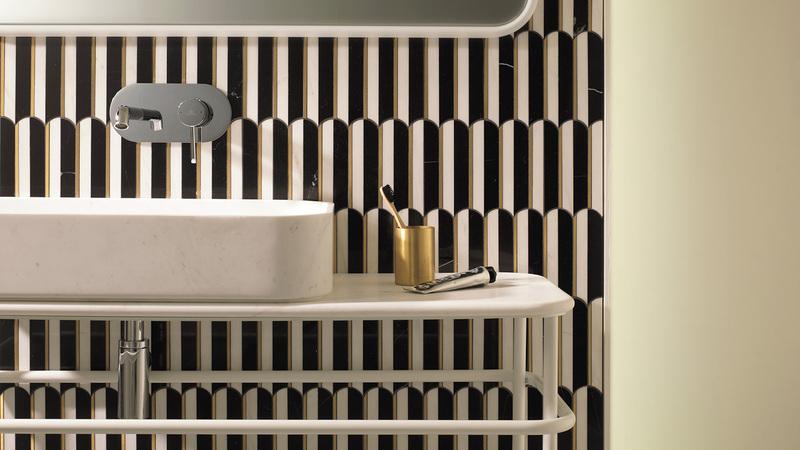 In aesthetical terms, the through-body porcelain, thanks to its versatility, adaptability and the possibility of undergoing special cuts, has made creating a decorative effect both original in specific points and integral and homogeneous possible, through the flooring and covering continuity with the same material.